TPWD stocks Rainbow Trout throughout Texas during the winter months. 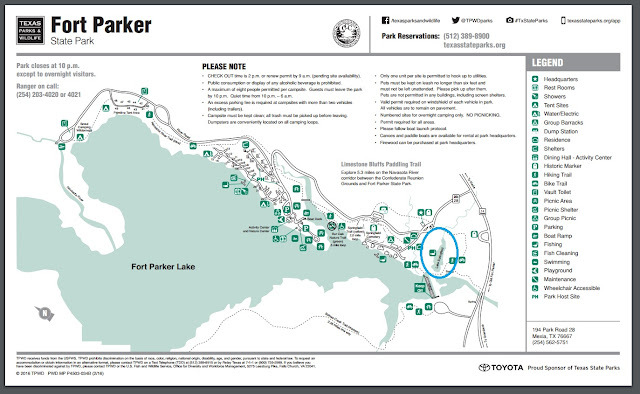 I don't often chase the Rainbow stockers, but when I do, I chose to fish Lake Springfield at Fort Parker State Park. I annually blog about it, around this time of year. Though we come only in February and March, the park staff remember that we come to fly fish. I love this state park for many of its treasures, but Lake Springfield is my favorite. Fort Parker receives 1,000 trout the last Saturday of January and holds a Trout Fishing Clinic where they teach kids how to fish. This year they had around 200 kids and landed about 75 trout. After Ranger Fisher shared that bit of good news, I figured the park would be crowded with about six or seven anglers fishing from the limited west shoreline. I was genuinely surprised when I arrived at the trail head to discover I would have the five acre lake all to myself. Be careful of your wishes! When I reached the lake, I knew why I had it to myself. While the water level is the highest I have ever seen, it is in terrible condition due to some kind of algae and early duckweed. What was a five acre fishing spot has been reduced to about two acres. This has been the most segregated fishing site I have ever fished. In years past, without fail, Rainbow Trout stay at the much cooler west end; Sunfish species stay at the north end and spawn at the east end; Largemouth Bass stay at the stumpy south end. I navigated as best I could and cast the CodyBugger to areas that used to hold fish. With the high water levels, a spring could be seen bubbling just to the east of the white PVC pipe, and in that area, the algae growth is somewhat abated. It is quite shallow, as when my top water fly landed, about a dozen tadpoles jumped out of the water. Usually, the bottom is visible, but not with the water levels as they are; however, the water is still quite clear. Curious, I put my waterproof camera on a weighted selfie stick, and began searching for fish. The density of the growth has pushed the fish towards the middle of the lake. I saw no turtles--with the camera or ascending for air. There are a total of three bird nests in the trees surrounding the lake--two to the southeast and one in the west--the least number of nests I have personally seen. I counted three buzzards flying overhead, where in years past they have flown overhead in groups of six or more, even strafing us at times, observed from the trees, observed from the ground, but they just aren't present. The bird box at the east end of the lake is inaccessible by float tube, and there were no Herons present along the shore. Mounds of green algae were piled beside the overflow gate where an almost futile effort has been made to keep the grate clear. Green and brown algae were caked all over the grates. I returned to the west end and continued to catch trout--landed four 12-inchers, three on the CodyBugger and one on a size 18 Goddard Caddis. With the sun setting below the west berm, I called aloud, "Last cast." I had tied on a size 20 mosquito, as the calming winds and mosquito hatch were quite prevalent. About 12 feet from my float tube, BAM! FishOn! The Rainbows had been hitting the flies really aggressively and hard, so I thought I had my limit. Low-and-behold, it wasn't a Rainbow; I had the most beautiful Bluegill with spawning colors take a topwater fly! The light was poor and my photo doesn't even begin to do it justice, but it was The picture-perfect Bluegill, and he was caught in the cooler west end--a first for me. As I was releasing him, I looked to the southwest, along the last area of fishable shoreline, and along the algae line, a 2.5 - 3 pound Largemouth crashed the water chasing mosquitoes. Typically, a larger fish won't chase the small flies, especially in colder water, but this guy did. That tells me his diet has been affected. The density of this algae is choking out the oxygen and affecting a number of species. The Duckweed comes and goes, but this brownish-reddish mess has got to go if this little lake is going to thrive.